As we’ve shown in the Rhom section, adding synchronized data via RhoConnect to your Rhodes application is as simple as generating a model and enabling a :sync flag. This triggers the internal Rhodes sync system called the RhoConnectClient to synchronize data for the model and transparently handle bi-directional updates between the Rhodes application and the RhoConnect server. 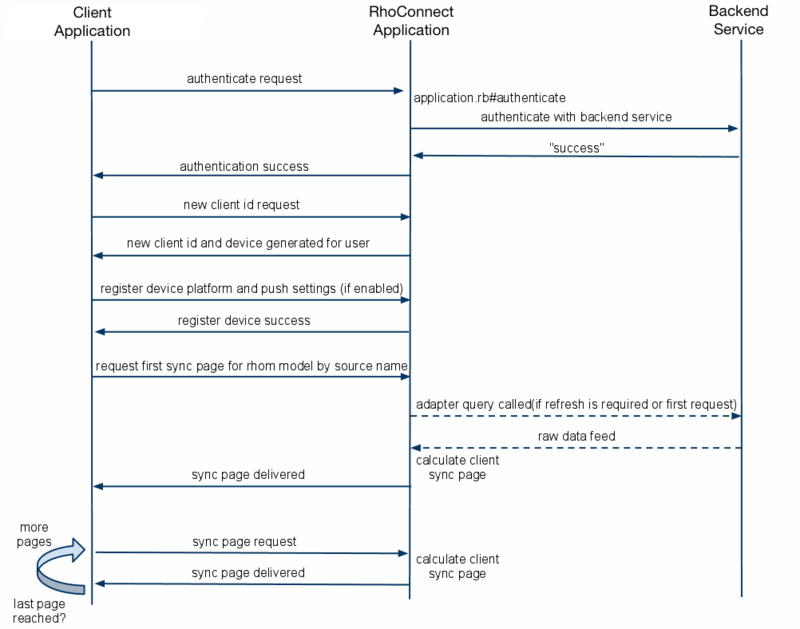 This section covers in detail how the RhoConnectClient works in Rhodes and how you can use its flexible APIs to build data-rich native applications. The RhoConnectClient interacts with RhoConnect over http(s) using JSON as a data exchange format. With the exception of bulk sync, pages of synchronized data, or “sync pages” as we will refer to them here, are sent as JSON from RhoConnect to the RhoConnectClient. RhoConnectClient sends authentication request to RhoConnect via RhoConnectClient.login. RhoConnect calls Application.authenticate with supplied credentials and returns true or false. It requests a new unique id (client id) from RhoConnect. This id will be referenced throughout the sync process. It will register platform information with RhoConnect. If this is a push-enabled application application, the RhoConnectClient will send additional information like device push pin. RhoConnectClient requests sync pages from RhoConnect, one model(or Rhom model) at a time. The order the models are synchronized is determined by the model’s :sync_priority, or determined automatically by the RhoConnectClient. When you generate a Rhodes application, you’ll notice there is an included directory called app/Settings. This contains a default settings_controller.rb and some views to manage authentication with RhoConnect. Here login is called with the login and password provided by the login.erb form. A :login_callback action is declared to handle the asynchronous result of the RhoConnectClient.login request. When RhoConnectClient.login completes, the callback declared is executed and receives parameters including success or failure and error messages (if any). This sample checks the login error_code, if it is 0, perform a full sync and render the settings page. Otherwise, it sets up an error message and re-displays the login page with an error. The RhoConnectClient system uses notifications to provide information about the sync process to a Rhodes application. Notifications can be setup once for the duration of runtime or each time a sync is triggered. One a sync is processing for a model, notifications are called with parameters containing sync process state. Your application can use this information to display different wait pages, progress bars, etc. 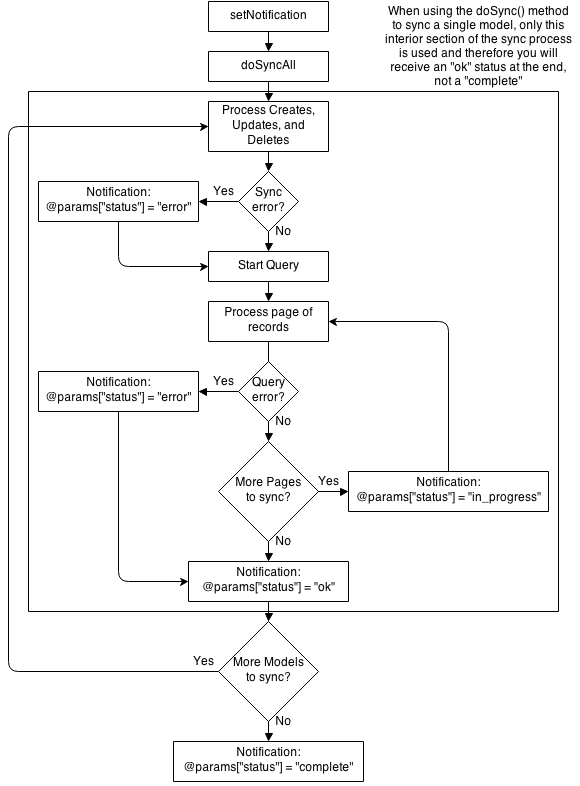 Below are two flowcharts describing the notification process during sync along with details of each of the steps. Each part in the flow chart also has an associated section below the two charts for even more in-depth description. The flow charts below shows the logic flow for notifications concerning model sync. Bulk sync and incremental sync are handled differently and therefore are illustrated in two separate flow charts. The details of each step are spelled out further down this page. It is important to note that, for bulk sync, the value of @params["status"] will only ever be “in_progress”, “error”, or “complete”. There is no step in the process that will return an @params["status"] of “ok” status. Instead, @params["bulk_status"] (described in detail below) can be accessed to get the status of the bulk sync job. This is done because of the asynchronous nature of the bulk sync process. In these examples, after the sync is complete the notifications are removed. This notification will not be removed automatically. When the notification is called, it will receive a variable called @params, just like a normal Rhodes controller action. These parameters are included in all notifications. @params["source_id"] – The id of the current model that is synchronizing. @params["total_count"] – Total number of records that exist for this RhoConnect source. @params["processed_count"] – Number of records included in the sync page. @params["cumulative_count"] – Number of records the RhoConnectClient has processed so far for this source. 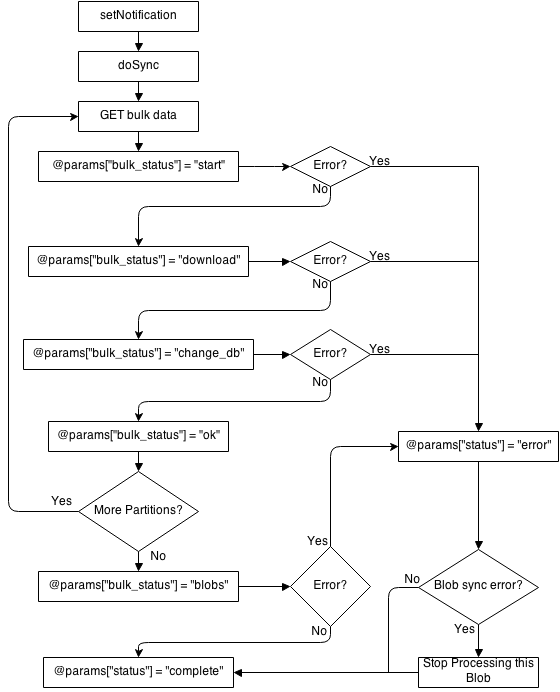 @params["partition"] – Current bulk sync partition. @params["error_code"] – HTTP response code of the RhoConnect server error: 401, 500, 404, etc. @params["server_errors"] – Hash of <model> objects of RhoConnect adapter error (if exists): “login-error”, “query-error”, “create-error”, “update-error”, “delete-error”, “logoff-error”. @params["processed_count"] – Number of records included in the last sync page. This status returns only when the RhoConnectClient process is complete. This status returns for bulk-sync models that use FixedSchema when the schema has changed in the RhoConnect server. In this scenario the sync callback should notify the user with a wait screen and start the bulk sync process. * action - May be :delete or :recreate. :delete just remove object from client, :recreate will push this object to server again at next sync. If not handled, local modifications, which were failing on server, will never sync to server again. So sync will work fine, but nobody will know about these changes. * action - May be :retry or :rollback. :retry will push update object operation to server again at next sync, :rollback will write rollback_objects to client database. * rollback_objects - contains objects attributes before failed update and sends by server. should be specified for :rollback action. * action - May be :retry - will push delete object operation to server again at next sync. If at any time you have records sitting on you server that have yet to be processed you’ll need to use the push_changes Rhom API method to force the server to process those records. The reason for this is that the server will not process records that are in its queue unless there are new records to sync. To artificially send a POST to the server and force it to process those records, you must use the push_changes method. For example, if you had a model called Product and you needed the server to process all pending product models sitting the the queue, you would use Product.push_changes(). elsif status == "complete" or status == "ok"
If the view was updated using AJAX calls, this mechanism may not work correctly as the view location will not change from one AJAX call to another. Therefore, you might need to specify the :controller option in WebView.navigate. The RhoConnectClient can also send a notification when a specific object on the current page has been modified. This is useful if you have frequently-changing data like feeds or time-lines in your application and want them to update without the user taking any action. The object notification callback receives three arrays of hashes: “deleted”, “updated” and “created”. Each hash contains values for the keys “object” and “source_id” so you can display which records were changed. Synchronizing images or binary objects between RhoConnect and the RhoConnectClient is declared by having a ‘blob attribute’ on the Rhom model. Please see the blob sync section for more information. If you have a large dataset in your back-end service, you don’t have to synchronize everything with the RhoConnectClient. Instead you can filter the synchronized dataset using the RhoConnectClient’s search function. Like everything else with the RhoConnectClient, search requires a defined callback which is executed when the search results are retrieved from RhoConnect. Typically you want to forward the original search query @params['search_params'] to your view that displays the results so you can perform the same query locally. Finally, you will need to implement the search method in your source adapter. See the RhoConnect search method for more details. On iOS, if application is put to background, it will be suspended. To allow application finish sync after application goes to background, you can use ‘finish_sync_in_background’ parameter in rhoconfig.txt. When this parameter is set to ‘1’, if sync is active in the time of background transition ( e.g. started from app_deactivate handler ), application will not be suspended until sync is finished.